The short answer is, you do not, even though the AdWords platform is requesting that you do so. That “enter billing” request ONLY applies to regular paid AdWords accounts. 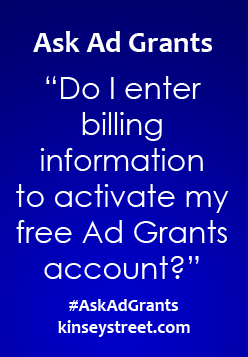 In fact, it is VERY important that you ignore requests to enter billing information when setting up an Ad Grants account because entering in any billing information will turn the account into a regular paid AdWords account and you will be responsible for all costs generated. Please read the Google Ad Grants help article: Ignore requests for billing information for additional information. No billing information added: If you click the settings icon in the top-right corner of your account and choose “Billing”, you should see a request to choose a country (no payment method visible).If your account is set up on a currency other than US Dollar, or billing information was added, you’ll need to create a new account starting with step 1 of this guide. Otherwise, continue. If you had already started filling out an Ad Grants application form, go back now and finish the form. If you haven’t started, follow the submission process for your country. Be sure to sign in using your Google for Nonprofits administrator account. This is the account that you used when you applied for Google for Nonprofits. It may be different than the account you use to access the product in which you’re enrolling. Click the ‘Enroll’ button underneath Google Ad Grants. See Grants Account Creation Guide for instructions on setting up your AdWords account. Enter your AdWords customer ID in the form field and complete the form. After that, it will take about 24-48 hours and then you will receive an email stating your AdWords account is approved (or not) for Ad Grants and that your account is active or that changes need to be made to make it active.